- 殘編 (Tanya Hsu) on 十二月 8, 2018. 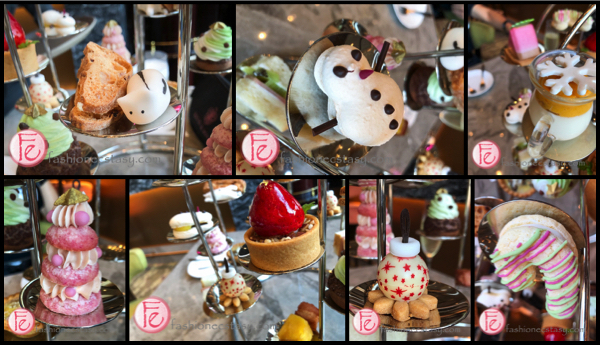 Christmas season has begun, Courtyard by Marriott Taipei’s lobby bar, The Lounge, is the first to launch a super-dreamy and festive Christmas afternoon tea set. The Christmas limited-edition afternoon tea treats are presented with a birdcage and have a total of 24 indulgent treats including a selection of French desserts and savory Spanish tapas. The set is super dreamy and colorful, melting every girl’s heart. We also tried Marriott’s All-day breakfast featuring out-of-the-world salmon eggs benedict! But it’s my favorite holiday season; I had to be the first to check it out. Courtyard by Marriott Taipei has long been one of my favorite luxury hotels in Taipei. When I visited Taiwan a few years ago, I also chose to stay at Courtyard by Marriott and ended up staying for several days instead of hotel hopping. The rooms are clean and comfortable and guarantee a good night sleep. Courtyard Marriott Taipei’s lobby bar is located on the 7th floor; the high-ceiling design makes it look spacious and comfortable. The lounge boasts large windows that brighten up the space. Most of the tables ordered at least one Christmas afternoon tea set when we entered, with most of the diners being women in about their forties or fifties. They made me feel more comfortable. Two of our guests joined last minute, so we ordered an additional Christmas afternoon set. Usually, pre-ordering is required for the limited-edition afternoon tea set, but we were lucky, the lounge prepared an extra set for us. Tap water was not served during our visit, so among the bottled mineral water ($200 – $280/ bottle) and the bottled sparkling water, we chose sparkling water ($220-280/bottle). There are 12 different kinds of sweet and savoury treats on the birdcage, two pieces each in a total of 24 pieces. In each set, there are two Marriott’s JC Cats made with sugar icing waiting to be discovered. Our cats were hiding behind the salmon crostini; I think they tried to steal our fish! pannacotta is topped with a thick layer of pumpkin puree a piece of sugar snowflake. It tastes natural and delicious. Raspberry chocolate mousse is made into the shape of a watermelon slice. It’s light and airy and melts in your mouth. This sandwich is made with soft white toast with a thin slice of kiwi and a piece of hamsandwiched in the middle. The “cheese” is actually Mayonnaise. The matcha whipped-cream on the chocolate puff pastry is actually made with a mixture of cream and sugar icing. The icing helps to keep the cream in shape. Strawberry dacquoise is a pink Christmas tower made with pink macaron and strawberry cream layers, topped with a Christmas star. The super cute little snowman is made of sugar icing. Salmon crostini is not the crispiest; but behind them is where we found our JC cats hiding. Eyes innocent, but definitely guilty for stealing our fish. Diced bacon is cooked with maple syrup with a piece of pineapple in the middle. The bacon is not greasy, and the skewer is the perfect balance between sweet and salty. There’s still a bit of emptiness in us after demolishing the two afternoon birdcages, so we ask for the menu for a real “meal.” The Western-style All-day Breakfast/Brunch menu is a pleasant surprise! All-day brunch selection includes omelet with 3 stuffing, Two Eggs any style: Sunny Side Up, scrambled, boiled, over easy, over hard or poached; submarine sandwiches, sandwiches, six-ounce beef burger, and my favorite: Eggs Benedict! Eggs Benedict are common in North America, but not so much in Taiwan, so we two Canadians choose this option. The brunch/breakfast set includes your choice of fish or meat, potatoes, bread, side dishes, and drinks, which is an excellent value for money! The Eggs Benedict has a western-standard quality. If I were to describe it in “fashion terms,” it’s “haute couture” tailored to your liking. Meat and fish options include Norwegian smoked salmon, deep-fried Dory fish, German sausage, Virginia ham or smoked chicken. Potatoes can be served as french fries, herb potato, mashed potatoes or hash browns. Bread includes a choice of brioche, croissant, bagel, onion ciabatta or English muffin. If that’s not enough, a “garnish,” is also included with the choice of mixed salad with olive oil & vinegar, fried mushrooms, air-dried tomatoes, pan-fried bell pepper, or seasonal fruits. A beverage choice of Americano (ice or hot), cappuccino (ice or hot), latte (ice or hot) English breakfast tea (hot), Earl Grey tea (hot), chamomile tea (hot), iced lemon tea, iced milk tea, orange juice or watermelon juice is also included. Two additional muffins are served on the plate, making it enough to go with the jumbo poached eggs. More smoked salmon is also served in the shape of a rose with capers, which can be paired with the two extra muffins. Courtyard by Marriott Taipei is conveniently located at Taipei Nangang MRT and HSR Stations. The building has direct access to transportation as well as Nangang’s Citylink Shopping Complex and business district. Courtyard by Marriott Hotel Taipei’s outstanding dining features are worth re-visiting.